B decided to wipe the patio with his face. I mean when does the instinct to put your hands out in front of you as you fall begin? I know toddlers are top heavy with their wobbly legs and balloon shaped noggins but, seriously!? Apparently he was playing with an excavator (no longer just a truck, these kids are specific and discerning) when he started to run to show it to someone and tripped. The excavator was completely unharmed in this incident. B on the other hand may be scarred for life. He cried one of those cries that starts out as long silent inhale, mouth agape, but ends up as a blood curdling horror film worthy screech. My heart dropped. I heard the thud of his over- sized head clunk the pavers like a ripe melon. After we calmed down and wiped him clean, all was well. One of the fathers there is a physician and examined B. No stitches or MRI’s needed, “just keep it clean and he’ll be fine”. In the end all he needed was a hug and a lollipop. I wish all troubles of the world could be as easily solved. Have you had any bad “ouchies” with your little one? This entry was posted in At Home and tagged birthday, celebration, face plant, friends, lollipop, scrape, toddler. Bookmark the permalink. Ouch, just reading about his spill made my heart drop! Glad he’s okay! My 10 month old is trying to walk, and has been bonking his head on EVERYTHING! 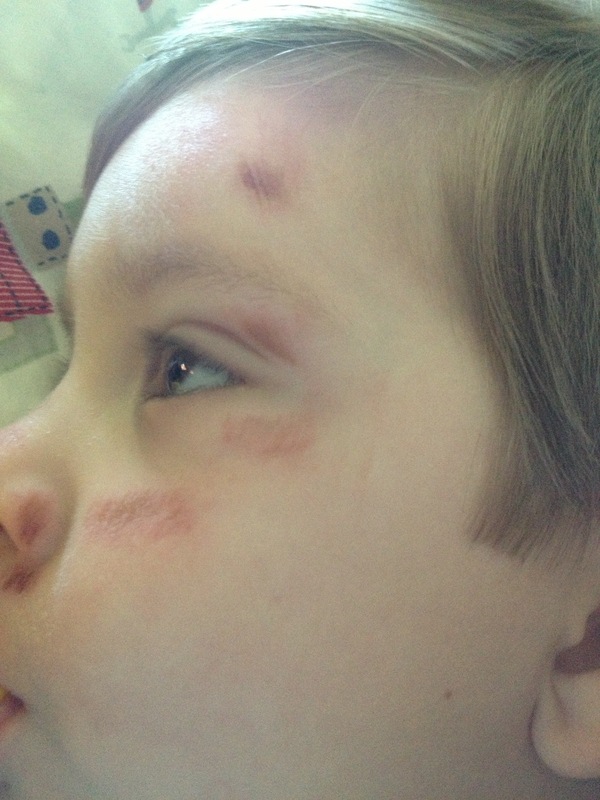 He hit his forehead on a doorframe last week, and rocked a nice, perfect vertical line bruise for a few days. Poor buddy! Yes, no door frame or table leg is safe anymore… Ugh! I want to wrap him in bubble wrap some days! !